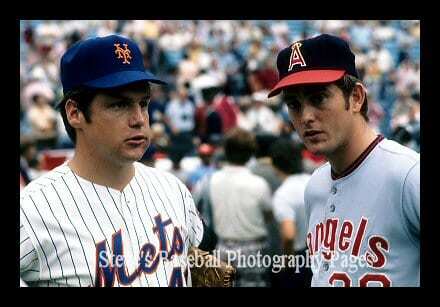 Love this photo of former teammates Tom Seaver and Nolan Ryan at the 1972 All-Star Game in Atlanta. The pic comes from the outstanding Steve’s Baseball Photography Pages, which I’ve casually browsed through before but had not fully investigated. This morning, I merely scrolled through the main page, but there are still the links to team galleries left to explore. Last year, I made a resolution on my photo blog to take at least one picture a day and post it. I kept to that promise and enjoyed both the process and the results. My hope for 2010 is to be more active on this blog and my personal one (I like to keep the baseball and photos separate from everything else, for some reason). And one way I hope to generate new content for myself is to finally sit down and scan in all the photos I took with my SLR back in the days before I went digital. There were a lot of baseball pics in particular (from the ’90s on), so hopefully I can post some of those here. But for now, there’s plenty to see on Steve’s pages. Great photo, I linked to a few from that same site yesterday. The old Mets unis are so much better.